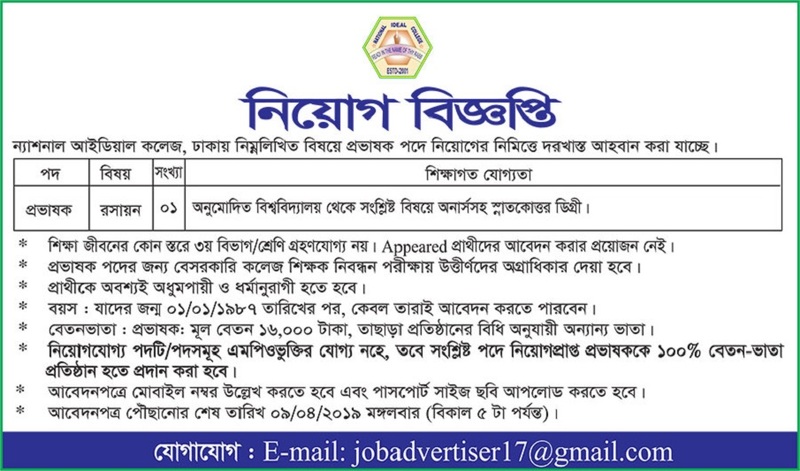 National Ideal College Job Circular 2019 has been published by their authority in daily online job portal and to get from the best jobs and the education portal website in BD Jobs Careers- www.bdjobscareers.com. For the user understanding, we would like to inform you that, National Ideal College (NIC)is a higher secondary institution in Khilgaon Thana, Dhaka, Bangladesh. It was founded by ideal foundation in 2001.The college provides education for science, commerce and art division and for both boys and girls. Classes are held at apartment building. The college has several buildings in Khilgaon. It is participating in HSC examination since 2003.Despite the college’s success in HSC examination since its establishment, it has been criticized for suspending students during academic year due to continuous poor result in internal exams.